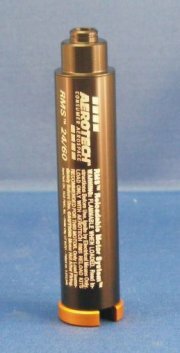 Aerotech RMS 24/60 Motor Complete [ARO-91244] - $55.24 : Sirius Rocketry Online Store, For the Serious Rocketeer! Aerotech has come out with the first brand new consumer RMS casing in years, and it is a great one! Introducing the RMS-24/60 casing! This casing was designed to be the one to add more "grunt" to kits that take the 3.75" long black powder E motors. Take this casing, add an Aerotech 24/60 reload kit, and get kicking F power in the same space as the black powder E's! Some of the E-powered model rocket kits are a bit of a "lob" on the recommended motors, and Aerotech takes care of that with this casing and the reloads that go with it. With an F, these slightly underpowered kits can really soar! Just a note: The end closures that work with this motor are NOT the same as the ones that work with the RMS 24/40 consumer motor and are non-interchangeable. 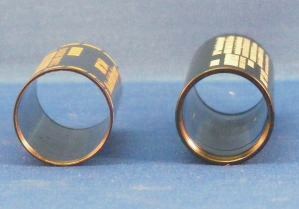 This is due to the fact that the casing itself is thicker (see comparison photo below), and more in line with some of the 29mm RMS casings. This not only makes for a more durable motor, but methinks Gary has some exciting things in store for 24mm reloadables in the future! Kit contains the Casing, Forward Closure, Aft Closure, Usage Instructions, and a 1cc packet of synthetic grease.